The Machine Gun Armory (MGA) was formed with the goal of modernizing the US Military's belt-fed light machine guns, such as the M249 SAW (Squad Automatic Weapon). Since 1984 there have been ZERO Product Improvement Programs (PIP) for the SAW from the US Department of Defense (DoD). In contrast, there have been 5 PIPs for the M16, keeping the M16 relevant and addressing the changing needs of soldiers. Clearly there is need for improving and modernizing the SAW. Multi-caliber, SAW fire power, in a unprecedented, compact and light weight package. Shown on the left is the comparitive sizes between our new MGA SAW K™ (top) and the HK® UMP (bottom). Available in 5.56mm, 300 Blackout, 6.8mm SPC, 7.62mm NATO and .260 Rem. 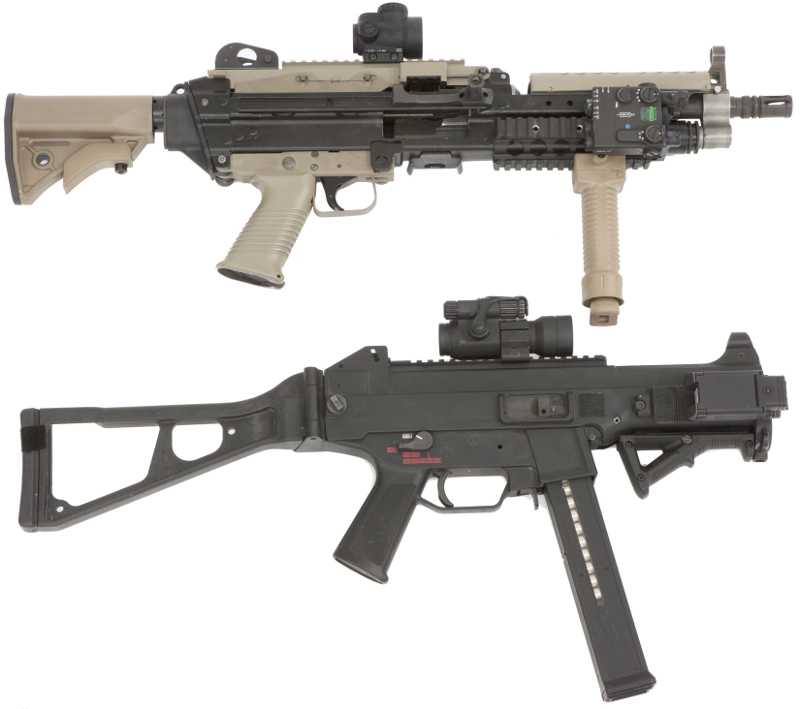 Full-sized, multi-caliber, modular, multi-mission belt-fed weapon systems with improved accuracy & modern accessories. New for 2016: an ultra-light & compact SAW - patent-pending modular, multi-mission weapon system. Full-sized, multi-caliber, multi-mission, modular, closed-bolt, belt-fed weapon systems with improved accuracy & new trigger group options. The full-sized MGA SAW™ and the new-for-2016, ultra-light & compact MGA SAW K™, are both re-engineered, modernized, multi-caliber belt-fed machine guns based on the venerable M249. Though originally based on the M249 weapon, the MGA SAW™ and MGA SAW K™ systems were completely re-engineered starting in the 2000s, to take advantage of the most modern metallurgy and technologies, resulting in a STRONGER but LIGHTER machine-gun platform.